l Current horizontal scroll origin. t Current vertical scroll origin. What I would like to know and can't find anywhere, is where is x,y? Top left? Center? I tried a few tests and can't figure it out. After extensive research and testing I've finally understood how scrollTo() works. (0,0) are the coordinates to the top left corner of the View container. When scrolling to any (x,y) point, the top left corner of the View will be placed at the (x,y) coordinates. If the View is showing an image, Bitmap, larger than the View itself, scrolling to (0,0) will place the View in the center of the image. This way, the top left corner of the image will be located at (-dX/2, -dY/2) and the bottom right corner at (mW - dX/2, mH - dY/2). dX represents the difference between the widths of the image and the View. And dY represents the difference between the heights of the image and the View. The attached image shows the graphical representation of the View and Bitmap image positioning. The visual x position of this view, in pixels. This is equivalent to the translationX property plus the current left property. For getY() it's from top. So (0,0) is top left. I don't know if scrollTo() takes into account the translationX property, because it's "recent" and I haven't been coding for a while, but I'd bet it does. Not the answer you're looking for? Browse other questions tagged android android-view android-scroll or ask your own question. 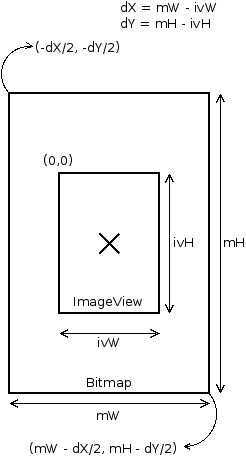 How to move ImageView from specified position? how to make scrollTo stop where I intend? Why does my android activity always start scrolled to the bottom?